It would be easy to think that Michigan, being surrounded by freshwater lakes, might be a bit short on shellfish and mollusks. But Michigan loves its fish, and oysters are no exception. With that in mind, check out these 10 great places to snag oysters in Michigan! Tom's Oyster Bar, a Royal Oak staple that's won a string of accolades, points out: “Eat oysters. Live longer.” While some might question those claims, there's no doubt that Tom's has plenty of oysters on hand for those who'd rather add a little time to their lives. Whether as part of Oysters Rockefeller, part of the Pan Fried Oysters, or even in the Oyster Du Jour in the Cold 'n' Smoked Array, you'll have plenty of oyster choices right here. Those who'd like something else, though, won't be disappointed either. Welcome to Ferndale, home of the Voyager II, which promises “Dinner, Drinks, Oysters” to its patrons. If you ever wondered what the difference between a Red Raider and a Shigoku oyster was—the former comes from Harwich, Massachusetts, and the latter from Willapa Bay, Washington—you'll find out right here. There are over 20 different kinds of oyster available here, including the Coromandel, a McGregor Bay, New Zealand import. The Detroit Fish House is located in Shelby Township, which is just an offshoot of Detroit. You’ll get plenty of oyster love right here. 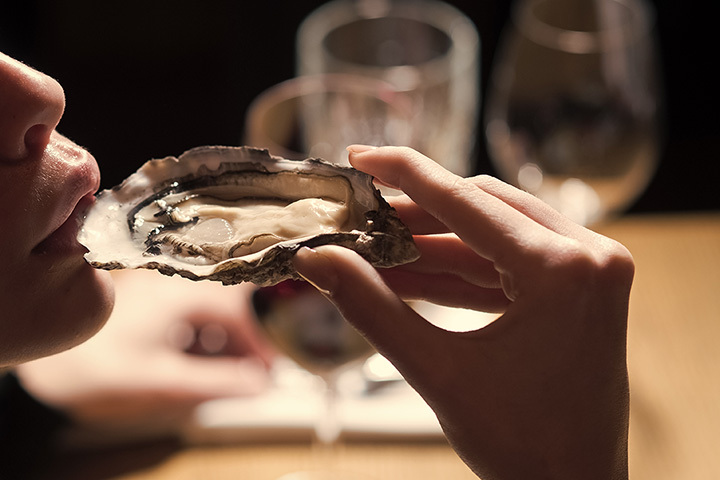 Stop in for fresh oysters or Oysters Rockefeller as part of the raw bar options. Beyond that, you'll have a range of soups and salads, steaks, and other seafood on which to feast, so prepare to walk away full from the Detroit Fish House. The Grand, in Grand Haven, has the distinction of being the first sushi bar in Grand Haven. There's more going on here than that, though, as it's also a seafood and oyster bar with fresh oysters shucked to order and served on the half-shell. The seafood selection, meanwhile, goes well beyond that to cover shrimp, fish, scallops and most anything else in between. Stop in on Tuesday nights to check out the Take Three Jazz Trio, and periodically to check out the seasonal specials. Hit The Silver Pig in Howell for a surprising range of oyster options. Of course you can get them in Rockefeller, but you'll also have your choice of East Coast or West Coast oysters (turns out West Coast costs a dollar more for a block of three, so not so bad) as well as Craig's Way oysters, which are served at East Coast rates with pepper and lemon. That accompaniment should make for a terrific oyster package overall. It goes on from there, of course, into a range of small-plate-style bites as well as various pizzas, but the oysters will certainly make a showing here. Grand Rapids offers up Carolina Low Country Kitchen, a place with a genuine Creole taste. Creole means plenty of seafood, and Carolina will be no exception. Carolina offers its oysters by the half-dozen, but will supply them in a surprising depth of options. You can have them fresh, of course, but also grilled if you'd rather have them with a bit of heat under them and your choice of five different sauces to accompany. There's also Buffalo style, which involves buttermilk frying. From there, you can check out a range of seafood, sandwiches, and desserts to make the evening complete. Located between Third and Fourth Streets in Rochester—they want you to be sure you find it—is Kabin Kruser's Oyster Bar, a place that plays up the nautical theme. It's actually part of the Rochester Chop House, which means you'll be able to segue from one food to another. An oyster stew starts things off here, along with a range of other possibilities, before going into a wide range of options here as well. Panroasts, Provencales and sandwiches mean that there's a fully-stocked menu waiting to dock at Kabin Kruser's. Three Rivers isn't exactly well-known for its seafood options, but one place is eager to change that perception. It's Fisher Lake Inn, and they'll start you right off with a half-dozen oysters on the half shell, with lemon and an accompanying sauce. It goes on from there, of course, into lake perch, crab-stuffed salmon, a range of sandwiches and more, but it all starts with oysters in the beginning, so come on in to the Fisher Lake Inn to enjoy oysters—and more—with a view of one of Michigan's many lakes. The Little Fleet, a collection of food trucks, has been running a special event for the last three years now known as Get Shucked! A festival of sparkling wine and oysters, Get Shucked introduces patrons to something they may not ordinarily find, including vintages from some of Northern Michigan's biggest names in sparkling wine. With tickets running $35 a person, it's clear this is a major event. You could be forgiven for thinking that the Sardine Room in Plymouth is focused mainly on sardines, but we assure you, seafood of all sorts is on hand here. The Sardine Room offers up a daily selection of oysters at the market price for either a half-dozen or by the piece. From there, you'll have everything from ceviche to a spicy tuna bowl waiting for you, and that's just the options at the raw bar. Small plates, large plates, soups and salads, even a couple of dessert options await. So whatever your taste, you should find it satisfied here.